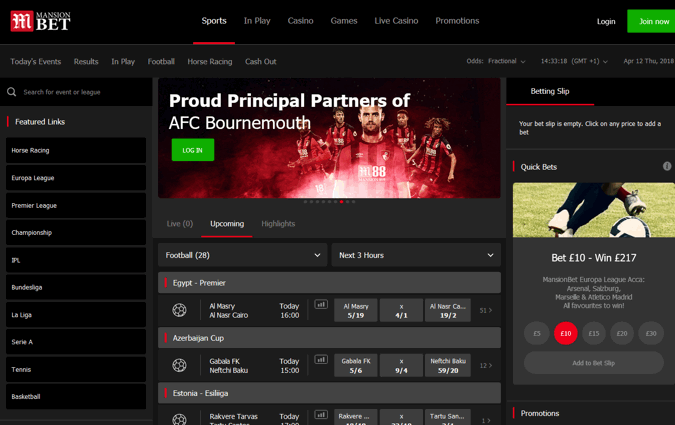 Those who watch a lot of Premier League football will be familiar with the MansionBet brand, current sponsors of AFC Bournemouth they have also sponsored Tottenham, Man City and Crystal Palace in the past. It therefore goes without saying that this is a good betting site for football especially, with some very good regular offers, features and giveaways. 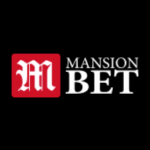 MansionBet is the sportbook arm of the massive online casino heavyweight, Mansion Casino, founded in 2003 in the early days of online betting. The impressive resources available from this brand means this is not a bit part casino with a sports betting product bolted on, rather this is a seriously big and competitive betting and gaming brand. There are over 30,000 live events to bet on each month spread across over 30 different sports. The platform is run by SBTech too, this is a fantastic refined and stylish system that is easy to navigate and use. New UK and Irish users who would like to try out MansionBet are entitled to a bonus on their first deposit, matching the amount you initially fund your account with 50%, up to a maximum of £50. To claim this bonus you must make a first deposit with either debit or credit card entering the code MB50 into the bonus field. Minimum deposit is £10 (giving a £5 bonus) and to claim the full amount of £50 you will need to deposit £100. The bonus amount must be wagered on sports bets with 4/5+ odds 6 times before the bonus and any resultant bonus winnings can be withdrawn. The bonus has an expiry of 30 days after award. Any winnings accumulated from real money bets made with your deposit can be withdrawn any time. Single bets placed on any type of Handicap or Under/Over market will not contribute towards completing the wagering requirement but all other single an accumulator bets (with cumulative odds of 4/5+, individual leg odds of 1/5+) will. Foracst and tricast horse racing bets also will not count. Mansion are first and foremost a casino and this the quality of the product is easy to see. This is an ideal site for anyone looking to play top end games but want the option to have a fully fledged sportsbook available too. If you think you may play more games than place sports bet then perhaps consider the casino welcome offer instead. An introductory casino offer is available if you would prefer this to the sports offer you can claim it instead. For full details of the latest casino welcome promotion along with full terms click below. MansionBet show their experience when it comes to their sports promotions for existing customers. While they are clearly a very good bookmaker for football most of their long standing offers are in fact open to all sports giving you far more choice in how you bet. In particular a great brand for accumulator offers. All Sports Acca Club – Giving you 50% of your weekly acca stake back up to £10 as a free bet. Place £20+ in bets (one or many wagers) on 5+ selection multiples with total odds of 3/1+ and individual leg price of 1/2+ to qualify (between Monday and Sunday weekly). Free token valid for 7 days to be used on any 5+ acca with the same odds as above. Acca Boost – In addition to the acca club all 5+ accumulators (with the same odds limits described above) will receive a bonus from 10% tired up to 50% in cash if they win. In terms of features MansionBet have all of the typical products we have come to take for granted when betting on sports, including cash out, high end live betting, stats and live results. Market depth is also impressive, and far bigger than you usually get from a casino-sportbook. When betting on a big footy match, for example, you can expect hundreds of lines with generally good prices across the board. Established back in 2003 Mansion are not a here today gone tomorrow brand, instead they are a highly ambitious, experienced and rooted betting and gaming company with their sights set on being one of the big boys of the future. 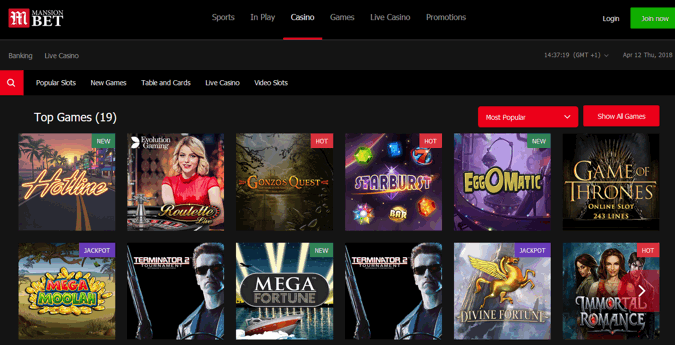 Initially known as a casino site, but don’t be put off, they have in fact developed a high end SBTech powered sportsbook that is better than many stand alone bookies. This is not just a brand for casino players who like the odd sports bet, it really is an all round gaming and betting site. Mansion are a Gibraltar based company founded by a group of private investors. From the outset the brand have been big sponsors of football and other sports and have shown an ambition to become a household name. The company employ over 150 people and hold a full UK gambling licence. Only three years after their launch Mansion sponsored Tottenahm Hotspur in 2006 in a £34M shirt deal. This was followed by later shirt sponsorship deals with both Crystal Palace FC and AFC Bournemouth. Customer support is available between 9am-1am daily and staff are particularly knowledgeable and attentive compared to other brands. Withdrawal limits are high, £100,000 daily maximum, deposits start at just £10, again with high maximums. The site as mentioned is powered by SB-Tech meaning there is no compromise on the interface, which to be frank is one of the smoothest and most functional around. Big operators like Ladbrokes could learn a thing or two about how to provide a seamless betting experience from these guys. If you are a massive sports bettor then Mansion may not satisfy all of your needed but for any typical punter who like to bet and play games there are few that can match the all-round package from Mansion.